In 1975, Ulla Schild became the custodian and head of the Jahn Library for African Literatures, which, at that time, had just been newly established as "Janheinz Jahn Library for Modern African Literature". Under her leadership, the Jahn Library had, by her untimely death in 1998, developed into an internationally well-known research institution. Ulla Schild was born in Berlin, 17th November 1938. She spent most of her childhood in Straßburg (Alsace) and, after World War II, in Oberkirch (Black Forest). In 1951, she, together with her parents, moved to Karlsruhe, where she finished high school in 1957. In 1958 she began to study German and English literature and linguistics at the University of Heidelberg and also attended lecture courses on Africa. After ten semesters, she enrolled in anthropology, specialising in African literature. In the mid-1960s, while still in Heidelberg, Ulla Schild eventually met Janheinz Jahn, who infected her with his enthusiasm for "neo-African" literature. Her encounter with Jahn was decisive for her future career and intellectual development (Riesz 1999). In 1968, she began to freelance, writing mostly on (neo-)African literature – all in all, more than 100 newspaper articles and book reviews (Czernik and Olivares Canas 1999). As Jahn's assistant and, by this time, also his partner, Ulla Schild worked with him very closely. Together with Jahn and Almut Nordmann, she co-edited the Who's Who in African Literature (1972). In 1972, Ulla Schild completed her M.A. studies in Anthropology at the University of Heidelberg. 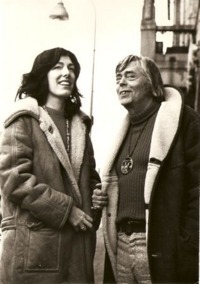 After Jahn's death in October 1973, Ulla Schild proposed to E.W. Müller, at that time a professor at the Department of Anthropology at the Johannes Gutenberg University Mainz, to acquire Jahn's personal library. This succeeded in December 1974, when funding was secured from the Deutsche Forschungsgemeinschaft (DFG) (special funds from the Stifterverband für die deutsche Wirtschaft). In 1975, the "Janheinz Jahn Library for Modern African Literature" was established at the Department of Anthropology and African Studies, at that time called "Department of Anthropology". Ulla Schild became a member of staff at the department, on a position which had been specifically created for her as the new head of the library. In 1980, Ulla Schild completed her Ph.D. in Anthropology at the Department of Anthropology and African Studies, Johannes Gutenberg University Mainz, with a dissertation on "Literature in Papua New Guinea". Her Ph.D. was supervised by E.W. Müller. The relatively small section of the library's collection which is devoted to "Oceanic Literature" reflects this research interest of Ulla Schild until today. Notably in the difficult phase following Janheinz Jahn's death Ulla Schild deserves credit for keeping the interest in African literature awake and alive: by the initiative to edit anthologies of criticism, special issues of scholarly journals, conference proceedings, works from Senegal to South Africa, from Nigeria to Kenya, and beyond Africa from Madagascar to Papua New Guinea. And always, she aimed not only for academic progress, for enhancing knowledge on Africa's literature, but also for mediation" (Riesz 1999: 307, translation from the German by Anja Oed). After long and severe illness, Ulla Schild died in Mainz on 22nd February 1998. In the words of János Riesz: "Ulla Schild will live on in the memory of many in many different ways, everybody will remember her in a different way, remember other words, and tell other stories" (Riesz 1999: 306, translation from the German by Anja Oed). Brandstetter, Anna-Maria, 1998a: "Dr. Ulla Schild". Obituary. JOGU 160 (April 1998), 31. Brandstetter, Anna-Maria, 1998b: "Character is beauty". Obituary. ALA Bulletin 24, 2, 43-44. Czernik, Godehard and Carolin Olivares Canas, 1999: "Schriftenverzeichnis Ulla Schild". Paideuma 45, 311-326. Jahn, Janheinz, Ulla Schild and Almut Nordmann, 1972: Who's Who in African Literature. Biographies, Works, Commentaries. Tübingen: Erdmann. Müller, Ernst Wilhelm, 2006: "Reminiszenzen eines Betroffenen". In: Anna-Maria Brandstetter and Carola Lentz (Eds. ): 60 Jahre Institut für Ethnologie und Afrikastudien. Ein Geburtstagsbuch. (Mainzer Beiträge zur Afrikaforschung, 14). Cologne: Rüdiger Köppe, 63-85. Riesz, János, 1999: "Ulla Schild (1938-1998)". Obituary. Paideuma 45, 305-310. Schild, Ulla, 1981: Literaturen in Papua-Neuguinea. (Mainzer Ethnologische Arbeiten, 3) Berlin: Dietrich Reimer. We would like to thank the Janheinz Jahn Archive Berlin for the pleasant cooperation and for allowing us to use the above picture of Ulla Schild (top right) and the big picture of Ulla Schild and Janheinz Jahn (far right) on this page.